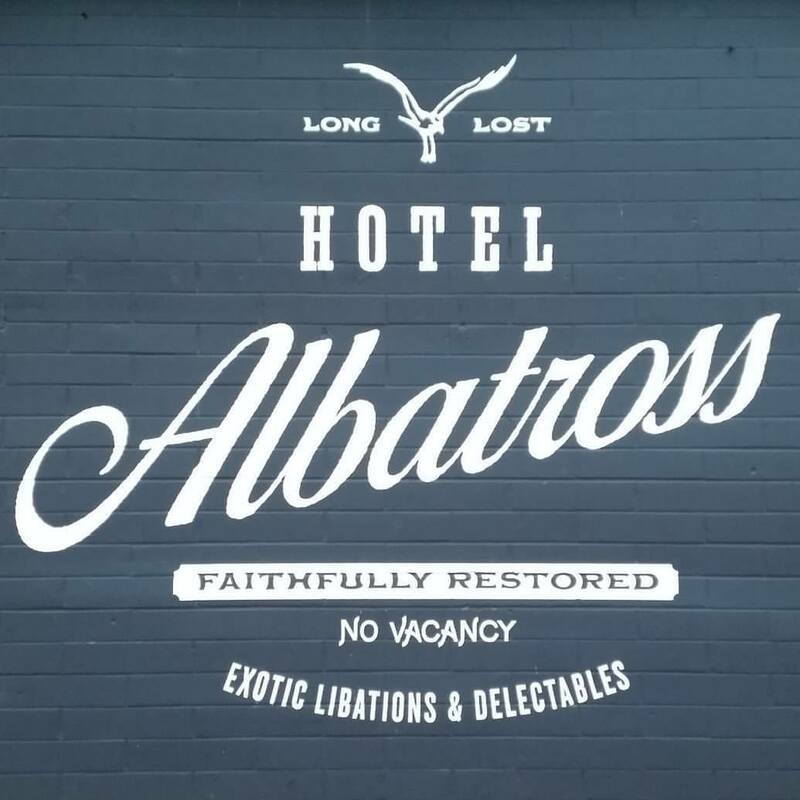 December 09, 2018 (Sunday) - Thayer Sarrano returns to the Hotel Albatross, site unseen since she last played there in December 2015. That Albatross Show of yesteryear was supplemented by two other Seattle performances at the Tractor Tavern, one of them three years ago to this very same day, and another, on December 15th of that very same year. Those shows then were, like the ones back in Portland in 2015 at the Doug Fir Lounge, courtesy of headliner Patterson Hood of the Drive-By Truckers, as accompanied by Chris Funk of The Decemberists. As for tonight, in the living present of 2018, Photo Ops out of Los Angeles joins the Sarrano billing, along with Dean Johnson, a local Seattle singer-songwriter. 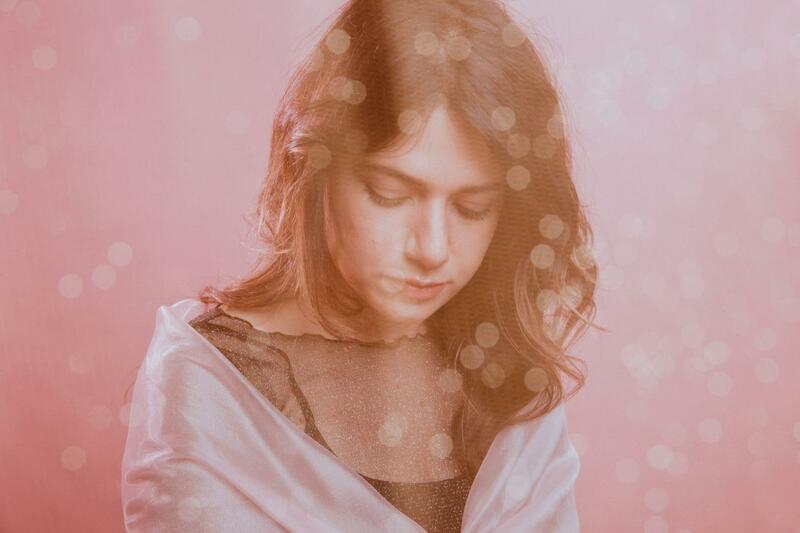 "The mark of a true musician is sounding just as good or better live than their studio-recorded records, and Sarrano possesses that quality. . . . Sarrano wasted no movement for sheer spectacle — she let the musicianship speak for itself. All of the musicians — including Sarrano — were adorned entirely in black, further communicating the importance of the music as opposed to drawing attention elsewhere. After all, when the music is this good, there’s no need for frivolity. The bold ensemble style she implemented for this show paid off: the instruments perfectly complemented Sarrano’s eclectic style. It was the perfect balance of orchestra and rock n’ roll, a mix not easily achieved." Many thanks to Anna Gilstrap and The Red & Black for the generous and insightful coverage. In addition to Sarrano herself, we would also like to thank the bevy of musicians who supported her in these various endeavors. For the "I Will Never Be Used to Your Beauty Single," those musicians included, proceeding alphabetically: Andy LeMaster (bass), Rick Lollar (guitar), and Jeremy Wheatley (drums). For the Georgia Theatre EP, they included: Keiko Ishibashi (violin), William Kissane (guitar, vocals), Luca Lombardi (bass), Jeremy Raj (oud, vocals), and Serena Scibelli (violin). We would also like to thank all those who engineered, mixed, mastered, and illuminated the proceedings: R. Sloan Simpson of Southern Shelter, who recorded the live audio, as house-mixed by David Hanna, which was then studio-mixed by Andy LeMaster, to be mastered by Jason Nesmith, and Jason Huffer, who gave this performance of luminaries some additional light that you can actually hear. December 08, 2018 (Saturday) - Things get full-on West Coastal in Astoria, Oregon. Haiti is quite distant, weather-wise and otherwise, but Voodoo finds a Room at the Columbian Theater on Marine Drive. 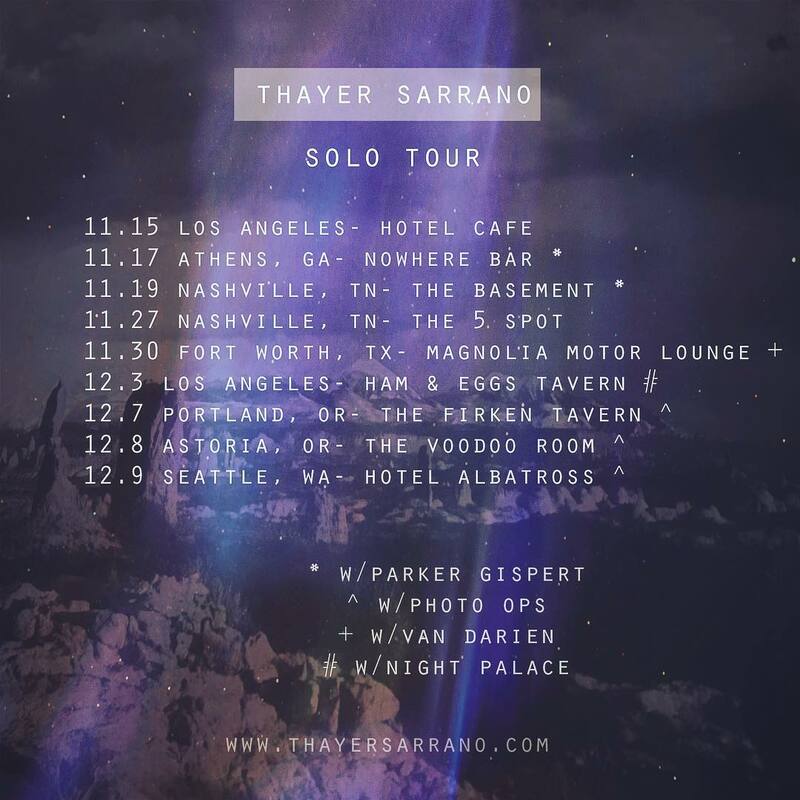 There Thayer Sarrano performs live. LA-based Photo Ops is also at it again. 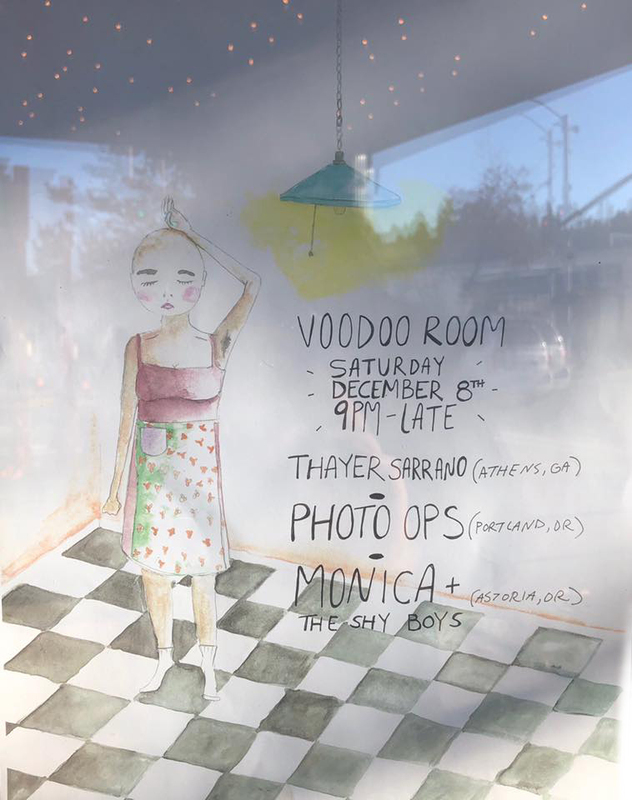 Those two acts are joined by Astoria locals Monica & the Shy Boys. Athens is also quite distant from Astoria, but it is closer than Haiti, and we can find no better place than here, to thank Gordon Lamb of our own Flagpole Magazine for the recent write-up regarding the Thayer Sarrano Acoustic Chamber release Live from the Georgia Theatre, categorized as a "near-perfect live record." We quote: "This smoky collection of slow-burning gems may well be something people talk about when they say 'remember when...'" We couldn't agree more.